One of the world’s first cultivated foods, chickpeas were eaten by ancient Egyptians along with the folks who created the Roman Empire. Then along came some Middle Easterners who pureed those chickpeas, also known as garbanzo beans, blended them with a few tasty ingredients and voila — hummus was born. 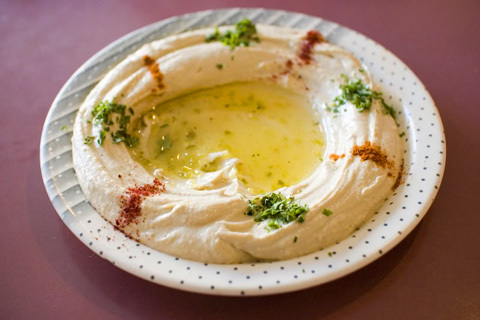 Now centuries later, hummus is big again. And why not? It’s got four powerful pluses going for it: it’s healthy, cheap, can be served in countless ways and it’s a breeze to make. Along with the main ingredient, chickpeas, typical hummus contains lemon juice or vinegar, garlic, tahini (sesame seed butter), and olive oil. The hummus in Martha Stewart’s basic recipe can be stored in the refrigerator for up to a week. Packed with protein and vitamins, hummus also contains rich minerals such as folic acid, zinc and magnesium. Along with other beans, it may help to defend cells from genetic changes that could lead to cancer, according to lab tests at the American Institute for Cancer Research. Beyond being used as a simple spread on sandwiches and wraps, hummus makes a great dip for chips or raw veggies, a zippy dressing (after being thinned) for salads, an accompaniment for burgers in place of ketchup or mustard, a topping for bruschetta and a less fatty substitute for mayonnaise or cream cheese. Because chickpeas compliment so many other flavors, the range of hummus dishes is wide in scope. This extensive collection of recipes even contains a hummus with black beans standing in for chickpeas. For those on a gung-ho diet, here’s a hummus recipe lower in the calorie department thanks to the addition of yogurt. Has hummus hit your dining table yet? Guess what we eat a lot of, like almost every day now? It’s true that hummus is easy to make and everyone loves it. That’s quite an endorsement. Have you lost some weight with your new diet? Looks that way to me lately. Why thank you. It turns out that I got my annual check up this morning and have lost 6.5 lbs, but need to lose at least 10 more. Disappointingly, the vegan diet hasn’t changed the blood pressure numbers. I felt sure it would but, no, they’re the same. Not high, but not low like they were when I was younger and thinner. Also, I need to do the blood work she ordered to see how the sugar is doing. That was creeping up a bit, hopefully it will be lower with a little weight loss and the diet. We’ll see. My physician says that sometimes the blood pressure just goes up with age no matter what — genetics. Congratulations! Losing weight later on in life is murder and that’s a lot to lose at one shot. As far as blood pressure, do you do much aerobic exercise, such as walking? I have a few health problems, but I think I’d be in a heck of a lot worse shape if I didn’t walk so much. I used to walk over an hour a day but my walking has been greatly curtailed since Nov. After foot surgery, I somehow fractured a foot bone so I’ve been restricted to how much I can walk till the whole shebang heals and it’s been KILLING me. Bought some lemons today to try hummus myself. Made hummus with Martha Stewart’s recipe and it’s fabulous! With no cooking, it’s perfect for summer meals with a salad.